Jonathan Papelbon has never been very popular in Philadelphia. He’s just not an easy guy to like, and he draws a large salary, even though he wasn’t a member of the great Phillies teams of 2007 to 2011. In fact, he arrived in 2012, right when Philly stopped dominating the National League East. You can’t really blame Papelbon for this. The Phillies decline has a lot more to do with injuries to Chase Utley, Roy Halladay and Cliff Lee, and the rapid decline of their highest paid player, Ryan Howard. Papelbon has actually been quite good in Philadelphia, saving 67 games with a 2.67 ERA between 2012-2013 and then really stepping things up this season, despite his widely discussed declining fastball speed. Paps entered Sunday game against the Marlins with a 1.56 ERA and 31 saves. He was also leading all National League relief pitchers (a group that includes Craig Kimbrel and Aroldis Chapman) in bWAR. On Sunday afternoon Papelbon was pitching for a third straight day, having recorded saves in the first two games of the Phillies series against Miami. The Stanton-less Marlins got him in his third attempt to shut them down and did so in a big way, scoring four runs in the top of the ninth in what became a 5-4 victory. The Philadelphia fans, restless after a pretty dreadful season from the highly-paid home team, finally had their chance to boo Papelbon. And boo him they did. So much so that the excitable closer may have channeled Michael Jackson on the way to the dugout after his disastrous inning. Upon seeing the what he took as an obscene crotch grab, umpire Joe West ejected Papelbon from a game he had little chance of returning to anyway. After the game, Papelbon denied he had been trying to send a message back at the fans, saying he was simply “adjusting” himself. Papelbon also added he had no problem with the fans booing him. What do you think? 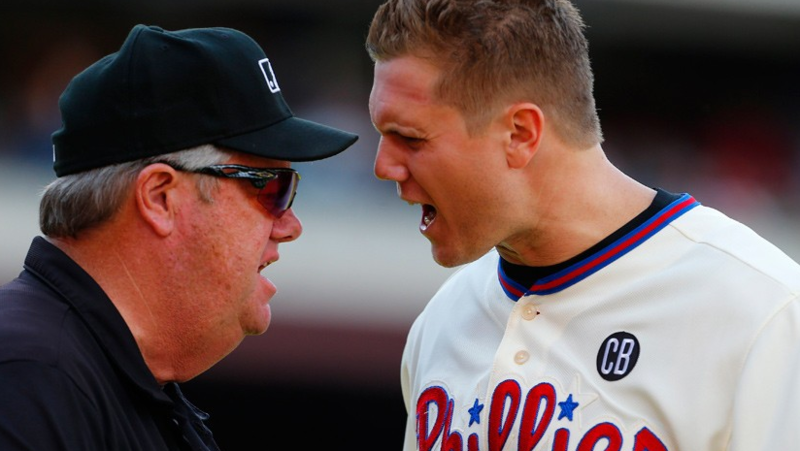 Should Papelbon have been ejected? 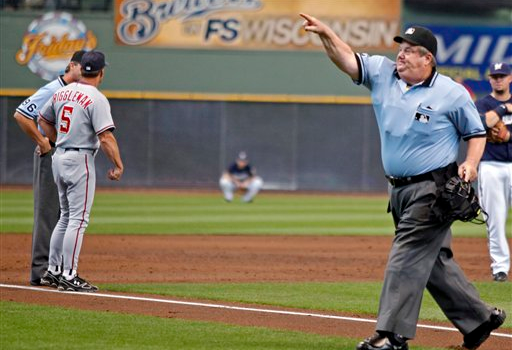 Or is this another case of umpire “Cowboy” Joe West making the game about himself?